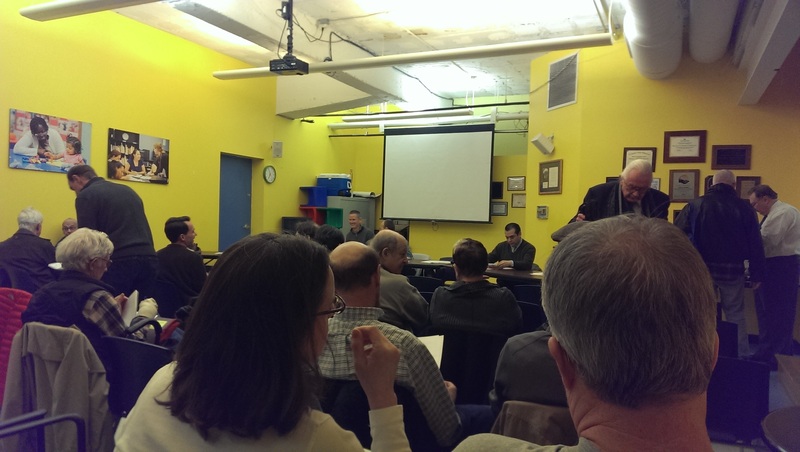 Notes From March ANC 1C Meeting | Park View, D.C.
Last night’s meeting of Advisory Neighborhood Commission 1C was well attended, primarily due to the Commission’s consideration of the proposed development at Meridian International (more below). In addition, the Commission also voted to approve a letter of support for the Rock ‘N’ Roll Marathon, unanimously supported a resolution calling for a Moratorium on Pop-Up Development (noting that ANC 1A passed an identical resolution in February), voted to join residents on a BZA Appeal for 2305-2307 Ontario Road, NW, and unanimously approved a resolution calling upon DCRA to stop using the perimeter wall method when calculating Gross Floor Area/Floor Area Ratio and calling for an administrative review of DCRA operations. 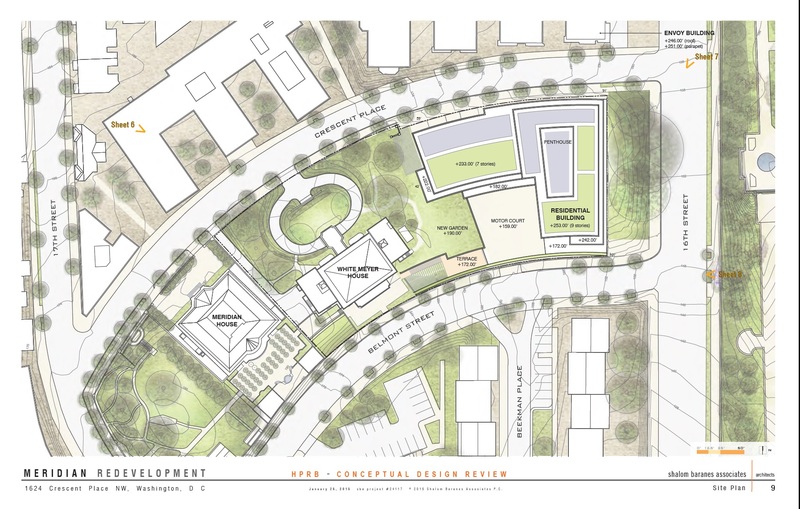 Site plan of proposed development (from ANC 1C Website). The agenda item of most interest to the community was the proposed development at Meridian International. Attendance was high at the meeting with attendees — many from Beekman Place and Crescent Place — overflowing into the hallway. 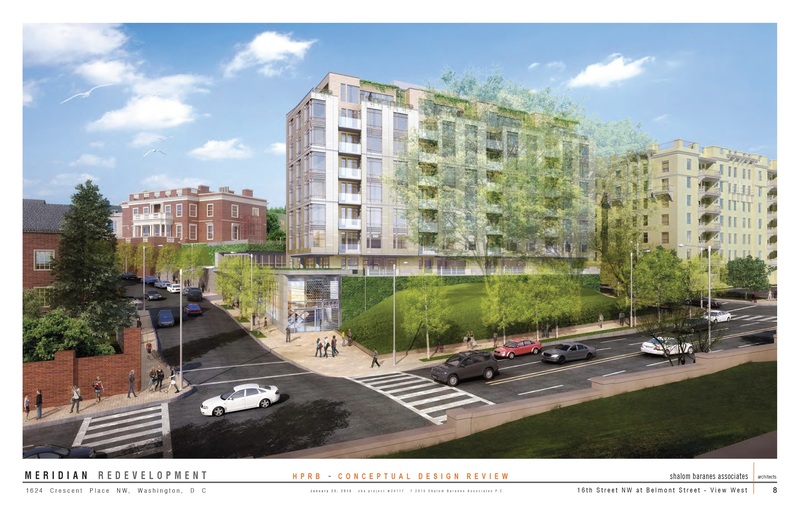 The development in question would face 16th Street between Belmont Street and Crescent Place, include approximately 130 units of residential housing, and include a conference center for Meridian International (connecting to the White Meyer House beneath a terrace). The development team gave a brief overview of the plans and spoke about how the building’s design is compatible with other apartment buildings on 16th Street. Architectural compatibility — a spokesperson from Crescent place described how each structure on that short street was an architectural “jewel”, with nearly all of them being on the National Register of Historic Places. When adding a new building to this “jewel box”, they argued that it should also be a “jewel” and a noteworthy architectural endeavor. Following up on this, another resident noted that the design for the addition to the former Italian Embassy successfully integrated with the historic character of its surroundings illustrating that a more compatible design at Meridian International was possible. Added to the list of community concerns, Chairman Billy Simpson introduced an amendment to the resolution under consideration that the design relate better to 16th Street. It was noted that other large apartment buildings on 16th Street have central entrances but that the design for this building did not, disconnecting it from the thoroughfare. Require a central entrance on 16th Street. This entry was posted on March 5, 2015 at 9:28 am and is filed under Community Meetings. You can subscribe via RSS 2.0 feed to this post's comments.